Pondicherry University Admission 2019: Pondicherry University will conduct an entrance exam for interested candidates who want to take admission into the University for the academic session 2019.This Exam will be held at university level. Candidates seeking admission in the field of engineering, management, commerce, arts etc can apply for the application form through online mode. The exam committee will issue the registration form on its official website. To appear in the entrance exam, students will have to submit the form before the last date. Pondi University provides various degrees such as Post-Graduate, Doctoral and Integrated research courses in the field of science, commerce, arts, management, medicine etc. the exam will be followed by GD & PI. After the release of final results, counselling will be started. 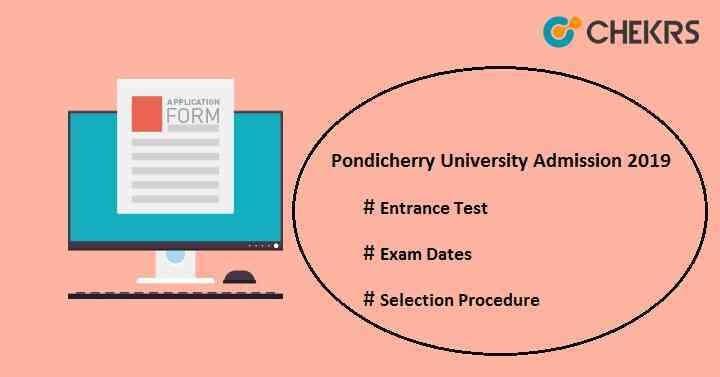 Here we have mentioned all the basic details about the Pondicherry University Entrance Exam 2019. Follow the tentative dates of Pondicherry University Entrance Exam 2019 here for better preparation. Integrated Courses Must have completed senior secondary education from any recognized board with at least 50% aggregate in the board exam or equivalent exam. PG Course Should have graduation degree from any recognized university/ institution and also score minimum 50% aggregate marks. Ph.D Courses Must have bachelor’s degree & master’s degree from a recognized university with at least 55% aggregate marks. PG Diploma Courses Must have completed their master’s degree from any recognized institutes or university with minimum 55% marks. The application form for the entrance test conducted by Pondicherry University will be available online. All interested candidates can register online for Pondicherry University Registration Form. Students will have to fill the application form for the course according to their choice. They can also fill in many application forms for each programme separately. Go to the Pondicherry University Official Portal. Follow the link given there for the application form. Click on the link, fill the form and then submit it. Pay the examination fee through both online & offline mode. The syllabus will be different for all courses. Candidates must go through the syllabus prescribed only for the courses they will apply. For MBA course, syllabus will be same as the syllabus of CAT/ MAT/ GMAT etc. Students can check the syllabus according to the courses they will select. The official authority of Pondi University will publish the Pondi University Exam Syllabus on its official site. Applicants who want to appear in the university entrance exam must check the Pondicherry University Previous Year Paper. It will have to achieve good marks in the examination. Students preparing for the exam must check the Pondicherry University Sample Paper and solve it to improve the speed and accuracy. It gives idea about the pattern and difficulty level of question paper. Make a time table and study accordingly. Make point on important topics and revise it on regular basis. Eat healthy foods to stay fit. Try to solve previous year papers within the time duration. Go through the entire syllabus for the entrance exam. Pondicherry University Admit Card will be available on the official website of the university. The head controller of entrance exam will upload the admit card one or two week before the examination. Candidates, who registered them successfully, will be able to download the Pondi University Hall Ticket. Candidates will have to carry hall ticket to get entry in the examination hall. No one will be allowed to enter in the exam hall without the admit card. Click on the link present there for the admit card. Enter the asked details to download the admit card and submit it. After submission of required details, the hall ticket will be appeared on the screen. Take the print of it for further use. Go to the university official site. Go to the Admissions option present at the top of the home page. Click on the Entrance exam 2019-20 Results. Password and then submit it. Pondicherry University Scorecard will be displayed on the screen, download it and take the print of it for future use. The university will also release the cutoff along with the result on its official website. Candidates can check the Pondi University Cutoff marks according to the courses they will apply. The cutoff marks will be uploaded separately for different courses and it will be decided according to the category-wise. To qualify the examination, applicants must obtain the minimum qualified marks i.e. cutoff. Those who will not able to score the cutoff marks will not be considered for the admission process in the university. On the basis of cutoff marks, a list will be prepared that will be Pondi University Rank List and according to the list, students will be called for the counselling. Students have to report at the university premises to participate in the Pondi Selection Procedure. Students must present at the time of counselling with the relevant documents for verification. Counselling will be done through the offline mode. Candidates will have to register themselves and filled the choice form for the selection of colleges. On the basis of choices of colleges, seat availability & candidate’s performance in the exam, students will get seat in the Pondicherry University for the academic session 2019-20.